One of our most favorite pre-wedding functions at an Indian wedding, has to be the mehndi. Other than being a big all-girls party, the Auntyji’s singing Mehndi hai rachne wali, all your besties dancing around you, and bright, quirky décor, chaat chapatti and the full on girly desipan add the the charm of this very special pre wedding ceremony. With all the naach-gaana and enthusiasm already flowing around, we can agree that the décor only uplifts the entire vibe, sets the mood and gets the ball rolling. While we lovelove those all-marigold strung cycle rickshaws, bird cages with carnations, leheriya dupatta décor and the Rajasthani umbrellas, check out these mehndi décor and function ideas inspired by Prajal and Sunny’s wedding. They’ve added quite a twist and then some! Here’s to unconventional ideas, out of the box thinking and oodles of creativity this couple exhibited at their mehendi function décor. What a great way to start conversations, ease into a fun filled afternoon and put that big beaming smile on the face of your guests. 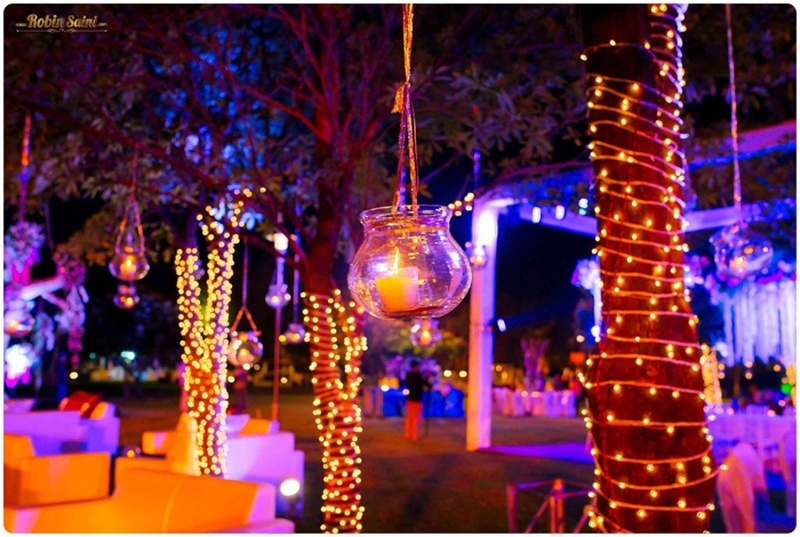 Trust us when we say, these ideas will make your wedding celebrations the talk of the town! Here’s a quick and dirty on some of these you could borrow or steal for your mehndi décor. Little details like these make a mehndi ceremony worthwhile. Bandhini cushions are not only strikingly colorful, they add an ethnic touch to the decor– Instagram worthy? We think so! We absolutely adore how this quirky couple mashed together technology and Bollywood films to create a filmstrip entrance. Why technology? Well if you look closely you’ll see how the family members’ faces are photoshopped into the bodies of famous actors – definitely a photoshop win and oh so fun! Outdoor functions demand bright colors and themes that stand out. Go a step further by using dhoop-chhaon styled table covers instead of solid colors to add that touch of ‘unconventional’ and richness to your décor. Along with those uber cute haldi-yellow stools and green focus lights, the animated stage backdrop is sure to be the instagram highlight of your mehndi ceremony. How can you ever go wrong with flowers? Bunch up your favorite flowers together with fresh ferns and you’ve got yourself a centerpiece that everyone will want to steal! Step aside photobooth frames, signages and colorful ribbons! The kitschy painted rickshaw is definitely gonna be a trendsetter. Jazz it up with some flowers and old glass bottles and you’ve got yourself a photobooth + prop all in one. Hire a carricature artist to add an unconventional twist to the usual Mehndi ceremony. An unusual idea that will not only entertain your guests, but will also serve as a give away that they’ll cherish for years! Prajal and Sunny opted to have a mini sangeet at their mehndi and went with an all-fuschia pink stage and tasteful décor featuring frames, fresh florwers and pinwheels. The backdrop as well as the width of the stage was bordered by yellow-hued bulbs and illuminated the entire space beautifully. Simple to implement but packs a powerful punch, doesn’t it? And when singing and dancing is going to be part of the show anyway, why not make an affair out of it.